This is a divesite that is usually visited near the end ot the day. It is a relatively shallow site with less life than most of the other divesites in the area, but the chance of seeing a cuttlefish usually makes up for this. There are several cuttlefish in the area, and are usuall found hovering around the bommies in the area. The cuttlefish is an interesting little animal. as it has similar behaviors as the octopus. 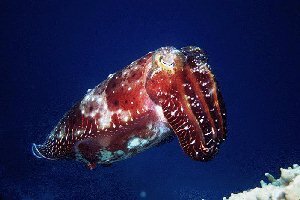 The cuttlefish rivals the octopus in its ability to change color in an instant. I prefer the watching the cuttlefish change color it has some irridescent qualities to the colors around its fins. Other animals that are here include blue spotted rays, anemonies, and featherstars. Cuttlefish cove is a small divesite and all one needs to do is wander around the bommies in the area and wait. It is best to move slowly as cuttlefish have excellent eyesight and will probably see you first. Wait around the bommies and explore all of them. There is also the reef wall to explore, where numerous small caves are found.